The church must be like water--flexible, fluid, changeable. 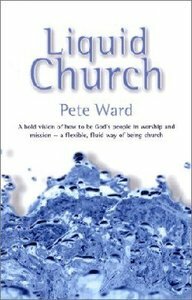 This book is a vision for how the church can embrace the liquid nature of culture rather than just scrambling to keep afloat while sailing over it.^Ward urges us to move away from the traditional understanding of church as a gathering of people meeting in one place at one time to a dynamic notion of church as a series of relationships and communications. In the Liquid Church, membership is determined by participation and involvement. Liquid Church is continually on the move, flowing in response to the Spirit and the gospel of Jesus, the imagination and creativity of its leaders, and the choices and experiences of its worshippers. - Publisher Scrambling to stay afloat in our society's troubled waters? Embrace the fluid nature of modern culture with a flexible ministry! Describing a bold vision for today's congregations, Ward helps you reconsider your church as a series of dynamic relationships in continuous response to the Spirit, the imagination of leaders, and the experiences of worshipers. Scrambling to stay afloat in our society's troubled waters? Embrace the fluid nature of modern culture with a flexible ministry! Describing a bold vision for today's congregations, Ward helps you reconsider your church as a series of dynamic relationships in continuous response to the Spirit, the imagination of leaders, and the experiences of worshipers. Pete Ward (PhD., King's College, University of London ) is Lecturer in youth ministry and theological education at King's College, London, and is the author of Youthwork and the Mission of God, Growing Up Evangelical, Worship and Youth Culture, Liquid Church and Youth Culture and the Gospel. He is the co-author of Youthwork and How to Do It, and the editor of The Church Today and Youth Ministry.